Utah Dodges the Bullet on Controversial Federal Water Rule | RANGEfire! SALT LAKE CITY — Utah Attorney General Sean Reyes is praising a 26-page ruling from a federal judge in Georgia that exempts Utah and 10 other states from a controversial regulation involving water. 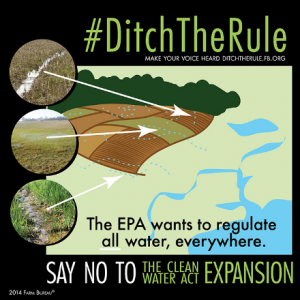 SEE also Ranchers Praise Delay of Controversial Federal Water Rule. Utah was among an 11-state coalition that filed for a temporary injunction to halt implementation of the so-called Waters of the United States rule, or WOTUS, because of its expansion of regulatory oversight. “We are encouraged that the federal district court has agreed with the merits of our challenge. The WOTUS rule vastly and unnecessarily expands federal regulatory powers in a way that threatens the sovereignty of states, the liberty of citizens and the viability of businesses,” said Utah Attorney General Sean Reyes in a statement released Tuesday. In the late Friday ruling, Judge Lisa Godbey Wood from the U.S. District Court of the Southern District of Georgia agreed with the states’ contention that implementation of the 2015 rule will cause irreparable harm. An injunction of the WOTUS rule favors the public interest,” she wrote, noting that farmers, homeowners and small-business owners will need to devote time and expense to obtaining federal permits — all to comply with a rule she predicts will likely be invalidated. The rule’s actual implementation is not until 2020, but it is being challenged in the courts and the U.S. Environmental Protection Agency indicated it is reconsidering the rule. Wood said the rule, by expanding the Clean Water Act to include certain waters not previously regulated, usurps state sovereignty. Farmers and ranchers worried the reach of the EPA and U.S. Army Corps of Engineers on navigable waters could be extended to ditches and farmyard ponds. In July, EPA Administrator Scott Pruitt visited Utah and toured a ranch as part of a review of the rule. At the time, he said regulating dry creek beds and puddles would impact land use across the country. Federal courts have now issued injunctions against the rule in 24 states. These folks have been reading too much Kurt Vonnegut about Ice 9. That the Feds even attempted this is proof of how much they care about undermining State sovereignty!! !